In the Via dei Servi, leading from Brunelleschi’s Duomo to the more modest but equally impressive Piazza Santissima Annunziata, appears the monumental edifice that once belonged to the prosperous Niccolini family. Palazzo Niccolini housed the sumptuous art collection of one of the family’s foremost art patrons: Giovanni Niccolini (1544-1611). He was the son of Agnolo Niccolini (1502-1567), a successful ambassador of Cosimo I de’ Medici. In the last years of his life, Agnolo even reached the status of cardinal. Giovanni followed in his father’s footsteps as loyal servant of the Medici court. In 1570, Niccolini became part of grand duke Cosimo’s entourage when the latter received the Grand Ducal crown and from 1578 until 1610, Giovanni resided in Rome as Florentine ambassador to the Papal court. His Roman sojourn influenced Niccolini’s art patronage, since he acquired many antiquities to adorn his Florentine palace. Over time, this splendorous collection became dispersed and it is now lost without any trace. 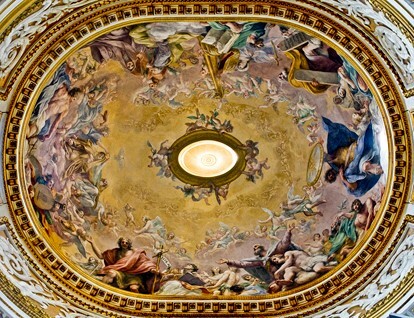 Fortunately, the Cappella Niccolini remains intact and gives an idea of Niccolini’s rich art patronage. 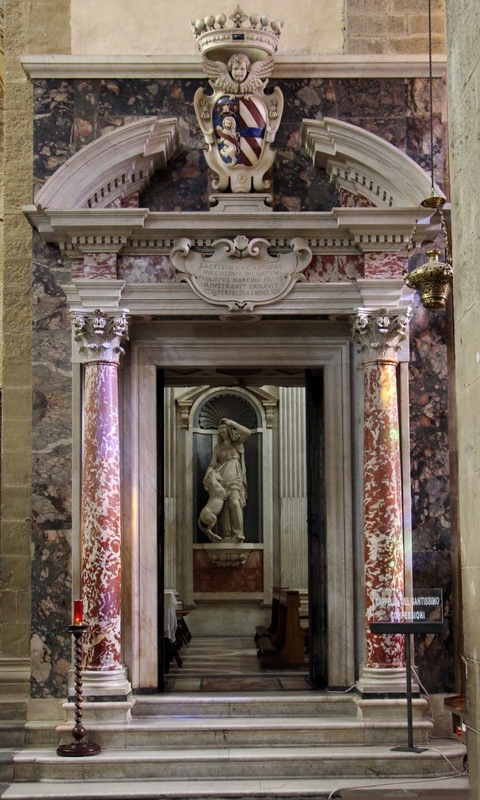 Giovanantonio Dosio (1533-1610) designed the family chapel in the Franciscan church of Santa Croce and decorated the walls with many coloured marble slabs of archaeological provenance, acquired on the Roman art market. As expected, I wanted to visit this sanctuary to gain a first-hand experience of Niccolini art. 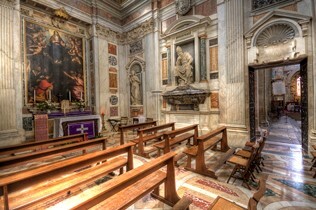 But there was a small problem: the chapel was only accessible for prayer during mass. I made an attempt to contact the Santa Croce by phone and e-mail in order to visit this rare Niccolini remnant. The Santa Croce referred to their webpage and did not reply to my message, so I switched to plan B: attend the Holy Mass. On a beautiful Sunday morning, fellow NIKI-intern Mélanie accompanied me to the Franciscan church. Since Mélanie was raised a Catholic, I needed her to provide me with some subtitles how to act to not look like a tourist too cheap to pay an entrance fee and decided to attend mass instead. 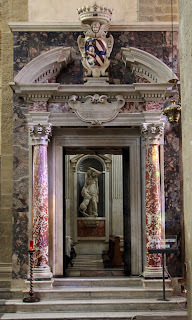 Everything went well: I took the right entrance, read the mass leaflet, tried to understand the priest’s wise words and I donated some money while keeping an eye at the sumptuous marble portal of Cappella Niccolini at my left. Mass was over, so time to claim my price after an hour of concentrated waiting. But the chapel was closed! In the blink of an eye there were wooden barriers keeping us from entering. Now what? Though I was still in a moment of surprise, Mélanie acted fast and walked right up to the altar. When a guard arrived, she asked him politely if there wasn’t a possibility to take a look. After a messy conversion in French, English and Italian, his answer was “no”. But after we mentioned we studied Art History, the guard started talking about the artists involved in the chapel’s construction and how he himself was an art historian. It seems this common interest made him understand the merit of seeing artworks in real life. So, this friendly Italian guard complied with a short five-minute visit. And there I was, surrounded by the five more than life-size sculptures and two enormous altarpieces by respectively Pietro Francavilla (1547-1615) and Alessandro Allori (1535-1607) that I so thoroughly studied for the Patrician Patronage Project. The chapel seemed much smaller in reality, but not less impressive. 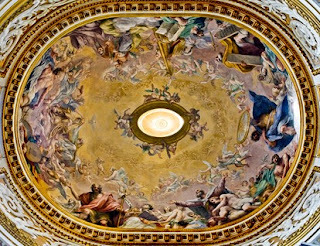 The coloured marble slabs and the enormous vault decoration by Il Volterrano (1611-1689), made me understand why Stendhal (you know, the one from the Stendhal syndrome) presumably fainted in this particular sanctuary after gazing at the overwhelming frescoed cupola. After some moments of silent and solitary art historical prayers in Cappella Niccolini, it was time to leave. To contemplate about the Niccolini meraviglie, we had a coffee and a dolce at Ospedale degli Innocenti’s sunny and tranquil terrace with a view at the Duomo. This experience shows how sometimes, all we need is a friendly help and the magic password “art historian,” to (literally) open gates to concealed artistic gems. See also the stories of PPP-interns Charley and Sinja!